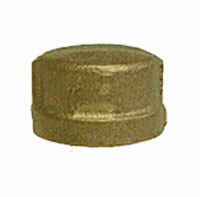 We offer our clients a large inventory of bronze caps ranging from sizes of 1/8" to 3". Our bronze caps are available threaded and come in various sizes to meet your pipe fitting needs. Our bronze caps come in a variety of sizes for almost any piping configuration. We offer high quality threaded bronze caps. We also offer an inventory of stainless and other steel products. View an overview of our product offerings. Our threaded bronze caps are available to meet almost any piping need. View our bronze cap product and other product dimensions. Please review our product dimensions to confirm your specifications. Various bronze reducing coupling sizes to meet your piping specifications. Our pipe sizes and weights chart will help you search needed tee and pipe product specifications. Our bronze caps conform to ASTM B62-93 (85, 5, 5, 5) C83600. Dimensions ANSI B 16.15, Threads are ANSI B2.1 or BA21 and Fed. WW-P-460 UL/FM approved. View our standard specifications chart. We also carry threaded or socket weld forged caps and other products to meet your piping system requirements. View various grades of stainless steel. View the thousands of bronze, stainless and other alloy pipe and tubing products we offer. This Reference Catalog identifies bronze caps and other pipe fittings through specification charts and illustrations. Bronze caps are pipe fittings that cover the end of a pipe. It is threaded where one can thread the fitting onto the end of a male pipe. Various caps can also be welded on with a socket weld cap. It�s best to allow extra pipe length before welding a cast cap on to the end, allowing this room will provide enough space for the cap to be cut from the pipe system when needed.